The slim design of the new VERO S NSR enables pallet loading extremely close to the machine table. This allows a low setup of the clamping station and pallet, maximizing utilization of the machine room. The high pull-in force creates an exceptionally rigid system with excellent holding power for maximum torques. Handling of heavy pallets (350 kg with a pallet size of 400 x 400 mm) therefore becomes safer and easier. The clamping slide of the module is monitored by the inductive monitoring of the piston. Combined with the monitoring for presence of a pallet, this guarantees maximum process reliability. The NSR can also be coupled with a robot, achieving pull-down forces of up to 15 kN, which makes for an extremely rigid system. It transfers torques of up to 1600 Nm, and is also suitable for reliable handling of heavy pallets of up 350 kg (with dimensions of 400 x 400 mm). Every quick-change pallet system is equipped with a double angle clamping stroke, and therefore allows such high weights. In order to achieve an optimal relationship between rigidity, robustness, and weight, SCHUNK engineers have designed every part that does not transmit force in aluminum, and parts that do transmit force in hardened stainless steel. 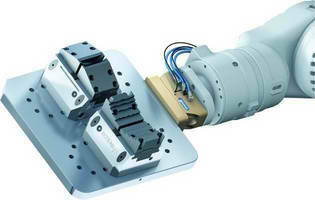 The module's are self-locking and uses form-fit clamping. At a pneumatic system pressure of 6 bar the module can be unlocked, without needing lubrified air. Opening, closing, and pallet presence are monitored via inductive proximity switches, and therefore the whole changing process can be monitored, too. Moreover, the module with a high compact performance is completely sealed and thus protected against chips and coolant. Overhead Robot Tracks handle static loads up to 5,000 lb.